The Professional Regulation Commission (PRC) announced on Wednesday that 2,491 out of 2,921 passed the Physician board exam given by the Board of Medicine in the cities of Manila, Cebu and Davao this August 2015. 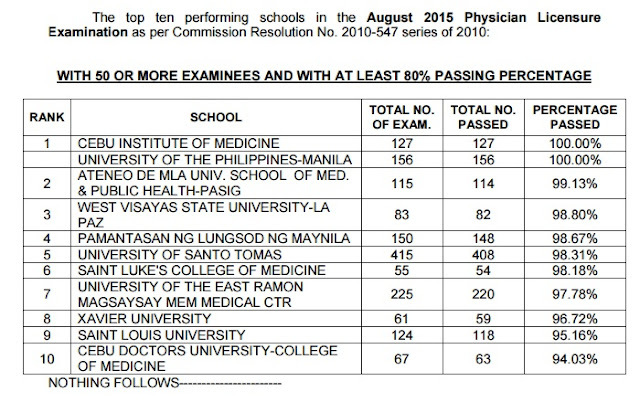 According to PRC, two schools got the 100-percent passing rate - Cebu Institute of Medicine (CIM) and University of the Philippines (UP) - Manila. 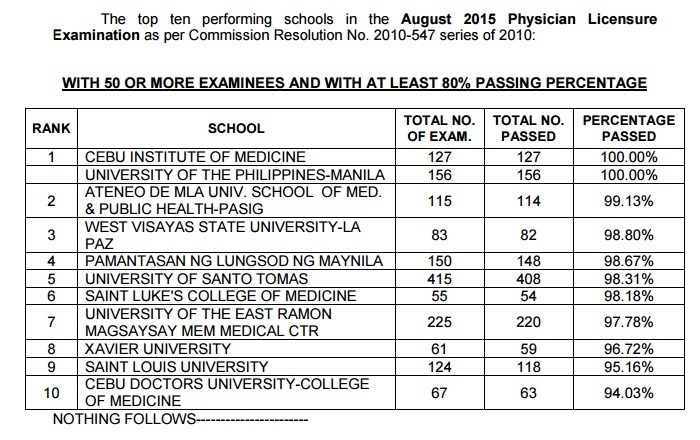 The top ten performing schools list in the August 2015 Physician Licensure Examination is as per Commission Resolution No. 2010-547 series of 2010. Included in the top 5 schools are Ateneo de Manila University (ADMU) School of Medicine and Public Health - Pasig, West Visayas State University - La Paz, Pamantasan ng Lungsod ng Maynila (PLM) and University of Santo Tomas (UST).